Prototype: 5 different type German Federal Railroad (DB) express train passenger cars, for the express train D96 "Isar-Rhone", with the routing Munich – Kempten – Lindau – Zurich – Bern - Geneva. 1 type AB4um-63 express train compartment car, 1st/2nd class. 3 type B4um-63 express train compartment cars, 2nd class. 1 type BRbu4um-61 express train half dining car, 2nd class. All of the cars in chrome oxide green basic paint scheme. The cars look as they did around 1965. Model: The minimum radius for operation is 360 mm / 14-3/16". The express train passenger cars have type Minden-Deutz trucks. All of the cars have factory-installed interior lighting with warm white LEDs. The express train half dining car has a factory-installed pick-up shoe. The entire car consist can be supplied with current by means of the factory-installed current-conducting couplers. A fixed, defined sequence of cars is prescribed to do this. Each of the express train passenger cars has 10 miniature figures as passengers. Total length over the buffers 141.8 cm / 55-13/16". The 43935 express train passenger car set is being produced in 2019 in a one-time series only for Insider members. 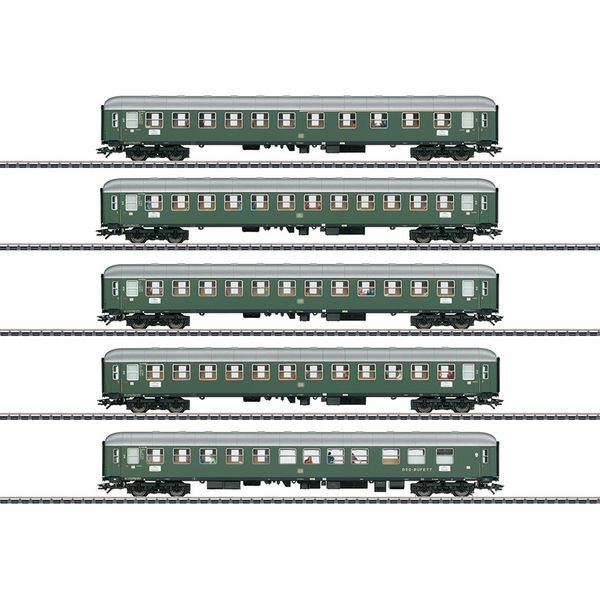 Another express train passenger car set is also available only for Insider members under item number 43385. The class V 320 heavy diesel locomotive is ideal with the 43935 and 43385 express train passenger car sets. The locomotive is also available exclusively for Insider members under item number 39320.